We will not be the mic testers at the Spring Convention in Iowa City. Thirteen people said they could make it but the balance was not going to work. I regrettably told them we will not be able to participate. Thank you to everyone who had committed. If you were going to be able to attend, consider helping any way you can. April 25th – We will be meeting with Marty Monson, CEO of Barbershop Harmony Society, at the Black Sheep Social Club, 600 1st Street SE, Cedar Rapids, at 5:00. Please let me know if you will be joining us so I can make reservations for the group. Sean Devine, of the Harmony Foundation visited. Sean is the lead of OC Times quartet and performance category judge for the society made a great pitch for supporting the Foundation. Sean wrote: Thank You for a great night, Harmony Hawks… So much FUN getting to sing along, and to be asked to spend some time coaching on the Performance Category – you really connected quickly to the concepts, especially with Love Letters! Thanks to John & Larry for including me, and to the whole Chapter for making me feel so welcome. Several of us even closed out the night catching up and singing a tag at the Starlite Room. A wonderful night of barbershop! I’m also grateful for the time you gave me to continue sharing about Harmony Foundation, and to talk a bit more about the successes our donors are making possible through life-changing music programs. A special thanks to YOU for your continued support, with 24% of your Chapter membership already participating in our Annual Giving programs! If you weren’t able to join us this week, or if you were there but didn’t have the chance to complete a pledge card yourself – you can join the Ambassadors of Song and/or President’s Council programs by CLICKING HERE – http://harmonyfoundation.planmylegacy.org/I do hope you’ll accept our invitation to take this closer look at how YOU can help preserve and encourage barbershop singing, while providing more opportunities for more people to FEEL what we FEEL! * Please take a look at the information shared, and reply back at your convenience… I look forward to hearing from you. 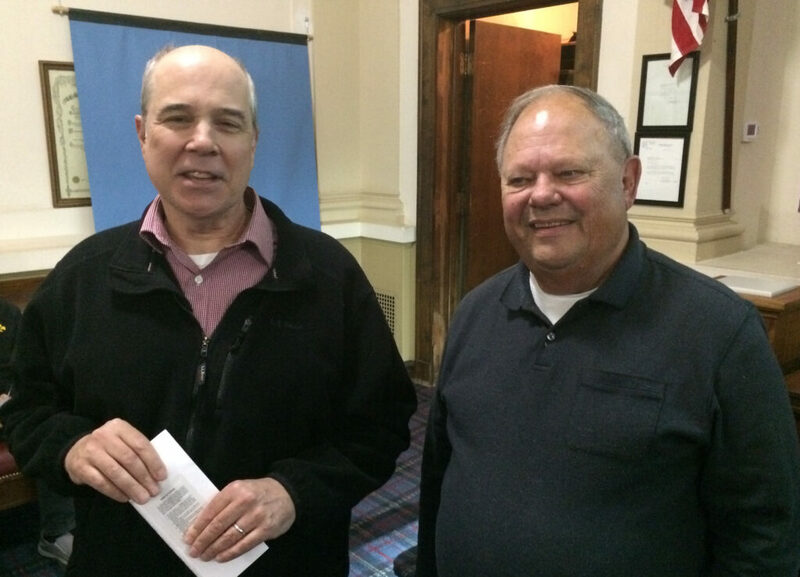 We honored Duane Scott last week for renewing his membership in the chorus. Duane has been a BHS member for ten years, a Harmony Hawk for eight years, and a member of Profound Sound quartet for four years. Duane is bass section leader and he has also served the chorus as show chairman and board member. Thank you, Duane for all you do for the chorus! This entry was posted in Board and staff notes, Weekly Updates. Bookmark the permalink.